I had a different post scheduled for today, but. . . We won! Finally, 30 years later and we are World Series Champions once again! My post last week talked about sticking with this team through all the years, of the last championship to the consistent losing to last year’s wild run. This one will probably be a jumbled mess, but humor me. I was annoyed with Halloween for falling on a game day. How dare it! Don’t worry, I had it taken care of. 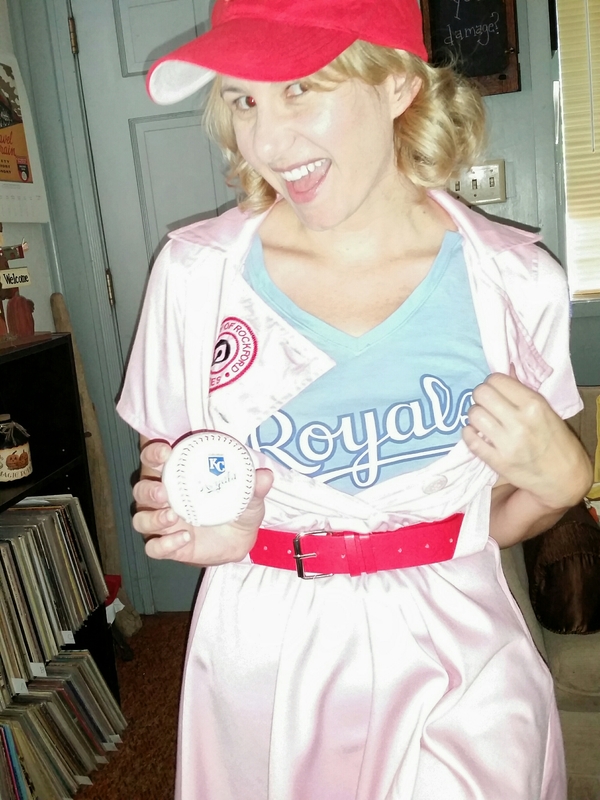 My costume was baseball oriented, and of course I had to incorporate the Royals into it. After watching the game at a friend’s house and celebrating a victory, we hit the town in our costumes. For some reason though, the Orange County Halloween party goers we encountered didn’t seem to even notice there had been a baseball game that night. How dare they! Even “Mike Trout” (a guy in a costume, not the real one) seemed oblivious. That didn’t ruin my victory high! Plus, we had a fun night and my costume was a hit! Then came Sunday and the reality of being one win away from the crown was sinking in. After watching the Chiefs actually win (far too early in the morning), the thought crept into my mind, “How great would it be? A Chiefs win in London? 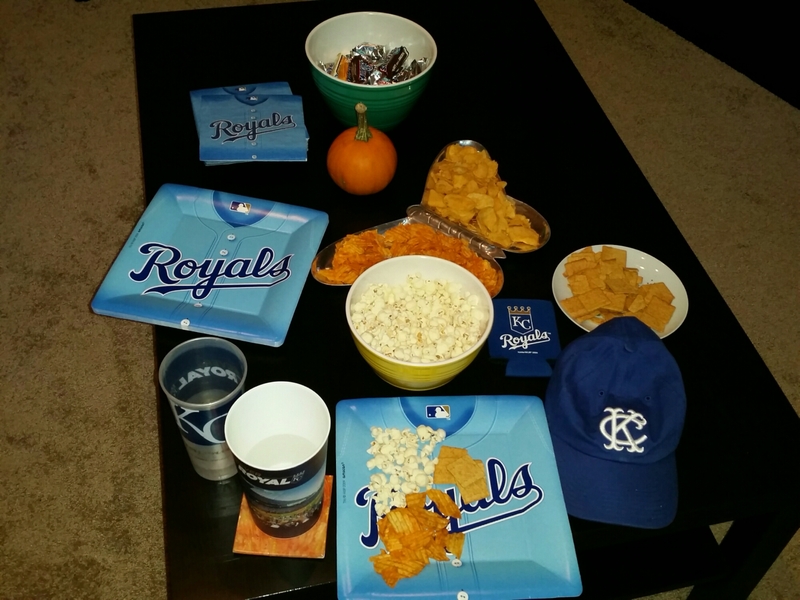 A Royals World Series win? Eeee!” I reminded myself not to get ahead of myself. My Dad said it would end Sunday, I wasn’t so sure. He was right, as he usually is about things. Never doubt the Dad! By the way, he said I couldn’t sit on his shoulders for the parade. I have no idea why. The Mets had a great run and I congratulate them on their season. They were a formidable opponent. Having been on the losing end last year we know how it stings, but how you have to be proud of how far your team made it, and being able to use it to build on for the next season. Those Royals, though! You can never count them out! They can be nerve-wracking to watch, but oh so exciting and fun! Having a Royal resolve isn’t just limited to fans, the whole team has a resolve worth envying. Late inning comebacks, never give up attitudes, clutch players, and playing fundamental baseball drove them all season, to be one of the best teams in baseball, and they rode that into the playoffs where they had to fight their way through some close games and tough teams. Their talent, enthusiasm, solidarity as a team, and their Royal resolve finally reclaimed a crown long ago lost. The pride, happiness, and mostly indescribable feeling I have is making my heart swell and making me think I have springs in my feet, I can’t seem to stop bouncing, and smiling. 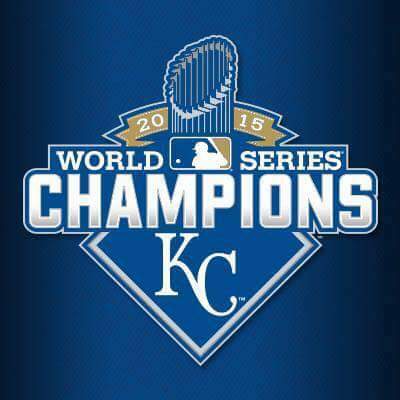 Thank you, Kansas City Royals! It was clearly a case of the better team winning. Congratulations to the 2015 Royals!! The Mets were good, but yes, in the end the better team won. Such a fun series to watch! 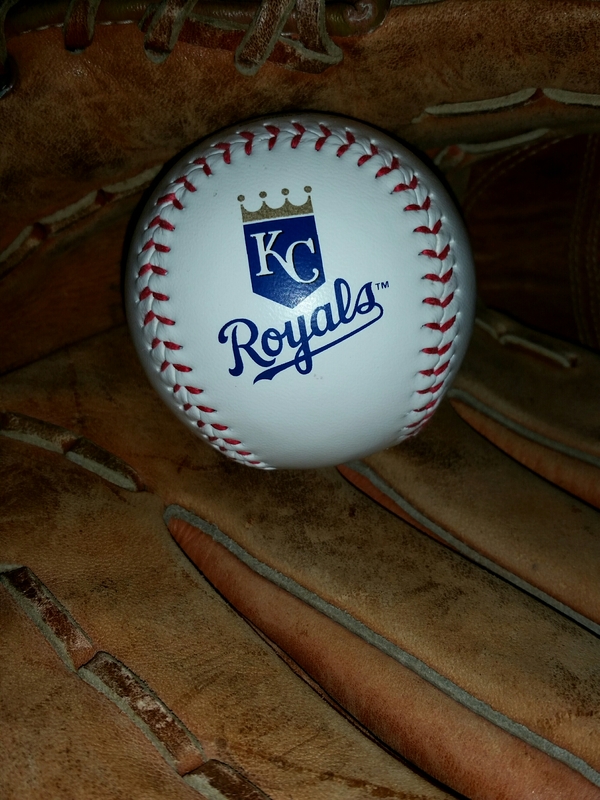 Royals should be back in World Series again in 2016. The Royals know how to win and may be building a dynasty. So, so happy for you! The Royals clearly wanted this badly and had no intentions of experiencing another second place finish. They were patient when needed, aggressive when required and steadfast throughout. It is an amazing feeling when your team wins a title after (too) many years have passed. I expected it to go the full seven before KC was champion but with all the extra innings maybe I wasn’t that far off after all! Enjoy!!! Thanks! I am definitely enjoying it, and will until opening day comes, and all through the season until a new champion is crowned! I thought it was fur sure at least going to six games, if not the full seven. I was surprised it actually came so soon. Though, you’re right, with all the extra innings I feel like I watched more than five games, my heart thinks it was more than five as well. Whew.